As with the history of alcohol, a snapshot of the present day in relation to alcohol is hard to summarise as it varies between race, geography, demographics, culture and legacies.It’s easy to get bogged down with the small trends, which is why it’s important to take a big picture view of alcohol in history. On the alcohol arc, the pendulum definitely seems to be moving less between the extremes and is moving closer to equilibrium. There are always specific areas of concern: minority groups, demographic groups and trends in certain countries. 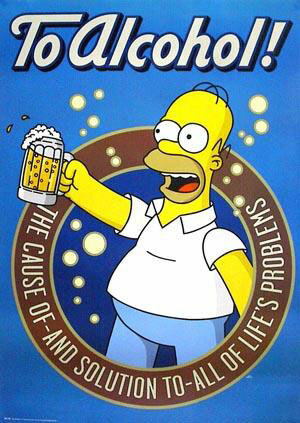 However, seen on a larger scale, the use of alcohol continues to decrease. The same drivers identified throughout history are still at play, showing in itself that the basics of our society haven’t really changed that much in the context of human evolution. 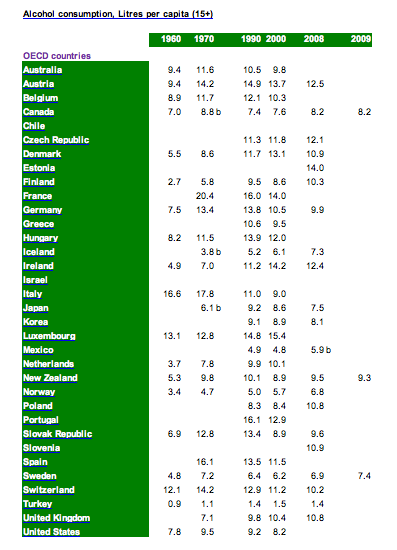 Trends in total alcohol consumption in Europe sees the differences diminishing as ways of drinking become more homogenous. Graphs and statistics can show us how much people drink. They can't show us if the effects of alcohol are increasing or decreasing and what that actually looks like in society. If we look at alcohol trends since the 1960’s, although there are obvious peaks and troughs, it seems that alcohol consumption is not increasing at alarming levels. Alcohol production is increasing because of population growth, and the fact that drinking habits are becoming more hegemonic throughout the world. As alcohol production increases, the industry continues to provide large amounts of tax revenue to government and profits to big business. It could be said that this point alone is enough to curb enthusiasm for more regulation of the industry. Suffice to say that with such large numbers of production around the world, there are many vested interests to keep the public consuming alcohol, even though there is clear evidence that the cost to society of alcohol abuse can sometimes outweigh the profits. “Alcopop” drinks are a clear example of the alcohol industry putting profits ahead of the welfare of the community, as they are blatantly aimed at getting teenagers who don’t like the taste of alcohol to start imbibing it by way of sugary, sweet drinks. The control of alcohol continues around the world in various forms. Most countries have some form of regulation of alcohol, with only a few countries or enclaves still totally prohibiting it. As alcohol has been particularly detrimental to indigenous populations around the world. many of these communities have stricter regulations in relation to alcohol and drugs. In Australia, alcohol is prohibited in many remote indigenous communities across Australia, with severe fines for anybody trying to transport liquor into these areas. Each country in the world provides an interesting study of the drug pendulum. At this point in time, no matter what the current legislation of a country states, it will only be the most recent pendulum swing between the constant search for moderation. Advertising is a fairly new form of control in the context of history. Advertising can influence a whole nation to change their choices and behavior.Advertising has an influence on alcohol consumption in several ways. It can create a narrative around alcohol that entices people to try it: youth culture, sophisticated socializing, social belonging, etc. It can influence attitudes towards alcohol that helps society aim for the moderation it seeks. Whether advertising is used for the good of society or for the good of big business depends on who pays for it and who controls it. Unfortunately, big business is able to pay money that government needs. Governments try and counteract the effects of alcohol advertising with advertisements that try to balance the view of alcohol by educating people about it’s unhealthy side effects both personally and for a community. Alcohol consumption increases at periods throughout history which see turmoil, displacement, loss of identity and boredom. We are currently in one of these crisis states with many people, especially our youth, searching for their reason d’etre. In current western societies, we have seen a slow decrease in community, connectedness, spirituality, purpose and a clear future. This is not a new thing, as can be seen in our historic timeline. However it is new by virtue of its scale and the collective consciousness of its being. Social attitudes to alcohol have a direct impact on alcohol consumption. Some of these attitudes are created through government bodies (see control), however once an attitude is adopted by a society, this becomes the accepted mentality and the society as a whole changes gear to fit in with it. Drink driving changed the way many people socialized, as did the designated driver campaign. However, although these campaigns were incredibly successful, alcohol consumption overall remains fairly constant. In past decades, teenagers had dancing and live bands to throw into the drinking mix. Now, a Saturday night is ostensibly just about drinking. There is nothing else to divert the attention from alcohol and the goal of getting “plastered”. Throughout history, youth have often been displaced, treated badly and set adrift in crisis situations. The fact that many youth today are pampered and richer than ever before may simply mean they have more opportunity to drink to excess than in the past. However, the fact that modernity has provided little other than getting drunk as a rites of passage means that the social attitude towards alcohol makes it a symbol, a “right” and a legacy to be claimed. 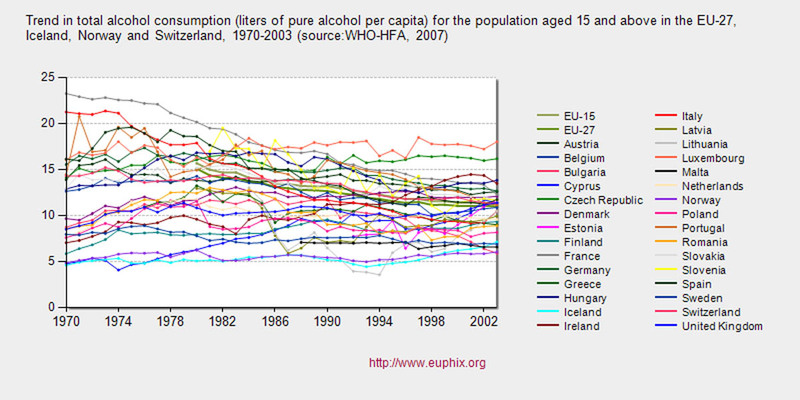 There has always been a vague north south divide regarding patterns of alcohol use. The synthesis of the Greek/Roman cultures and the Germanic cultures into various parts of Europe seems to be the backdrop for this difference. The weather and scarcity of alcohol in the North. Whatever the reason, there have been distinct drinking patterns around the world. However, research now shows that these distinct patterns are now merging. This move towards hegemony in our attitudes and preferences for what we drink and how we drink are a result of globalization. People are moving between boundaries more than they ever have, and tourism sees great influxes of different cultures into certain countries. These countries need to provide the alcohol requirements of these tourists, thus offering alcohol to fulfill different drinking patterns than the traditional ones. Alcohol has always been mixed, added to, refined and distilled. These advances have allowed for more variety in the taste of alcohol. In today’s society, these various forms are commoditized so that we have an array of alcohol choices presented to us in every liquor store. The distribution and packaging makes it easy for us to choose a flavor that suits our taste and requirements at any time.In recent years, we have seen the rise of a new variety of alcohol called Alcopops (pre-mixed, sugary drinks). Whatever the reason for this, it has a direct impact on the amount of people who become addicted to alcohol and to it’s associated impacts on society and health. Surely if we are concerned about reducing the costs to society, governments would work with industries to reduce the amount of alcohol content in their products?